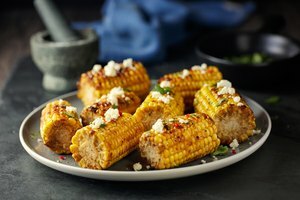 Corn on the cob is a staple starting from midsummer, when the first corn is available in grocery stores and markets, to the tail end of fall. The husk makes for a perfect “foil” wrapper for corn, protecting the kernels and letting you cook corn with minimal preparation. 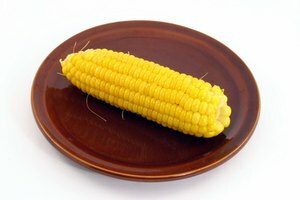 However, for less mess when eating, consider doing some cleaning of your corn -- such as removing the silk -- prior to grilling. 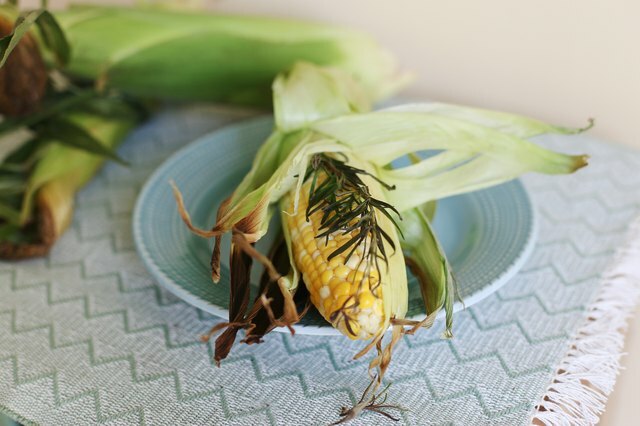 Grilling corn in its husk can be as simple as trimming the silk off the end and placing the corn on a hot grill. However, the silk inside softens and sticks when heated, making it difficult to remove. 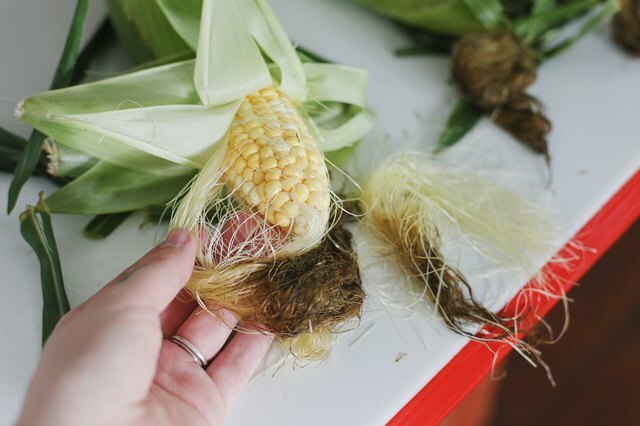 Clean your corn first by pulling back, but not removing, the husk, cleaning it of silk, and then re-wrapping in the husk. To help corn cook more quickly, as well as maybe develop a bit of a char, pull off and discard the first few layers of the husk. Season your grilled corn before or after cooking. Seasoning before means the flavors can penetrate the corn and benefit from the high heat of the grill. Because of the husk, you cannot season your corn during cooking, so flavor adequately before you start. 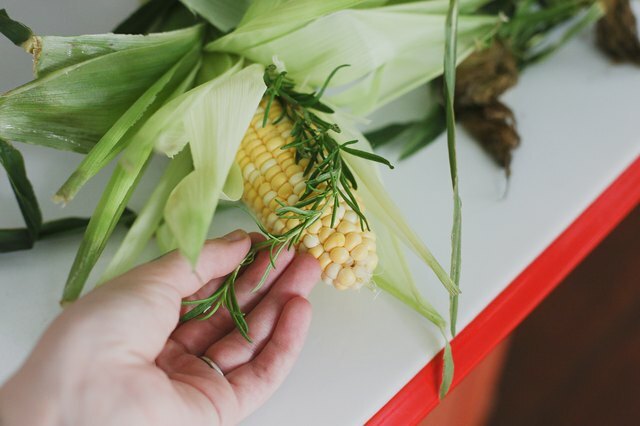 An easy, low-fat way of flavoring corn before grilling is to stick fresh herbs, such as rosemary or thyme, against the kernels, wrapping the herbs, along with the corn, in the husk. Let sit for 30 minutes to overnight before grilling. Seasoning your corn with a thin layer of melted butter or olive oil will add richness, while adding ingredients such as miso will make for a surprisingly tasty grilled corn dish. Preheat the gas grill, set to high, for 10 minutes before cooking the corn. Look for a temperature of roughly 350 degrees Fahrenheit. The husk will protect the corn from charring and burning. Turn your corn frequently when grilling to ensure even cooking. A few blackened kernels are desirable, but too many lead to bitter-tasting kernels. Serve while hot, removing the husk, and with extra butter on the side if so desired. For a similar effect with charcoal, wait for the flames from the charcoal to die down before placing the corn on the grill. The coals will still be red-hot. Infuse your gas-grilled corn with a smoky flavor with a pan of soaked wood chips to add extra smoke to your corn. While a charcoal grill provides some smoky flavor, a gas grill will provide char but no smoke. 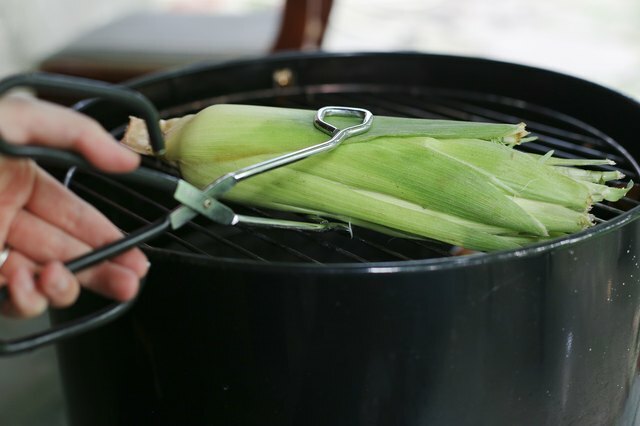 If you are cooking other items and want to give time for the smoke to penetrate the corn, lower the heat on one side of the grill to medium, and transfer your corn there. The indirect heat will cook the corn more slowly. On a charcoal grill, push your coals over to one side of your grill and place the cobs on the other side. The ambient heat from the coals will continue cooking the corn at a slower pace.